The details that fill the new area known as Storybook Circus are plentiful, and the hits are sure to keep on coming as the sub-land and Fantasyland expansion continue to unfold. Of course, this means that there is no time like the present to explore one of the many nods that pepper the landscape. 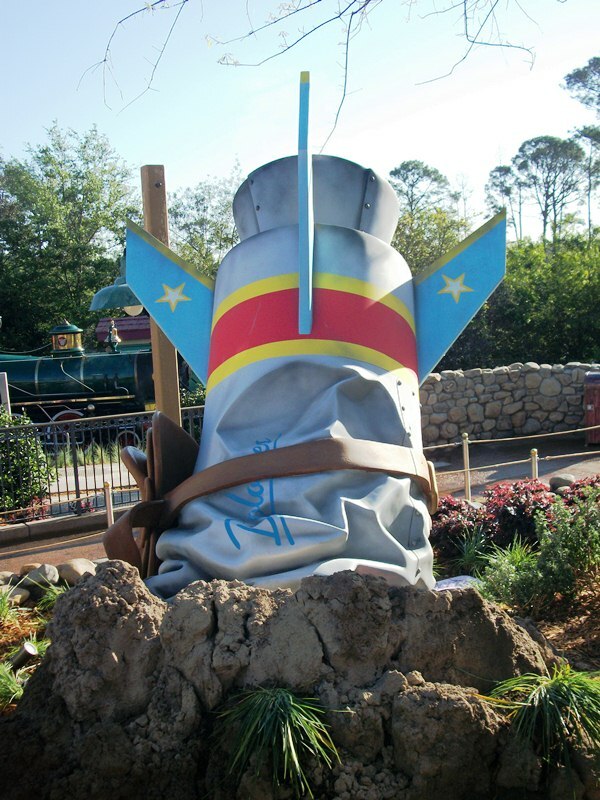 First up, the Great Goofini’s rocket, Dolores. The poster promoting this dazzling aerial feat gives a name to the stunt, Reckless Rocketeer, and feature Goofini, chaps and all, holding on for dear life as his saddle saddled projectile zooms across the circus landscape. For time and space’s sake, I’ll assume we all understand the Rocketeer reference presented here. The rocket itself can be seen just a short distance away, bent, banged, and contorted from its earthly collision. What really intrigues me, however, is the name of the rocket. To my mind, this is an apparent acknowledgement of the circus staple, Dolores. Featured in three shorts between 1945 and 1953, Dolores was a playful elephant that played opposite Chip, Dale, Donald and, most often, Goofy. The 1945 feature, Tiger Trouble, saw Dolores and Goofy, with Goofy riding atop her in a howdah, in search of a tiger. In typical Goofy fashion, clumsy antics ensued. She was again spotted, stateside in a circus this time, in the 1945 short, The Big Wash. In this cartoon, Goofy is the caretaker of Dolores, who wakes him up for her breakfast and tries every trick in the book to avoid her bath. When her trunk fills with suds, Dolores soap sneezes send her and Goofy rocketing off the screen left, right, up, and down. Her final appearance was in 1953’s Working for Peanuts, where she teams up with Donald in order to rid a zoo of the pesky chipmunks, Chip and Dale. While a grey rocket misfiring across the grounds of a circus may not seem to have a lot to do with this playful pachyderm, Dolores two distinct adventures with Goofy offer up a lot of fodder. 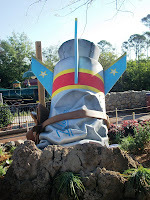 From rocketing around a circus to Goofy perched atop Dolores’ back, it is good to see some of the smaller, if not in size than at least in number of featured cartoons anyway, characters are still getting attention in the parks. Great, now I've got the "I'm-a gonna warsh Dolor-i-us" song stuck in my head! :) Seriously, though -- what a wonderful detail! Rich - Believe me, I had the song stuck in my head for days after writing the article! Great Goofy song though, right?